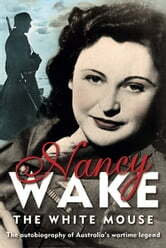 Nancy Wake, nicknamed 'the white mouse' for her ability to evade capture, tells her own story. As the Gestapo's most wanted person, and one of the most highly decorated servicewomen of the war, it's a story worth telling. After living and working in Paris in the 1930's, Nancy married a wealthy Frenchman and settled in Marseilles. Her idyllic new life was ended by World War II and the invasion of France. Her life shattered, Nancy joined the French resistance and, later, began work with an escape-route network for allied soldiers. Eventually Nancy had to escape from France herself to avoid capture by the Gestapo. In London she trained with the Special Operations Executive as a secret agent and saboteur before parachuting back into France. Nancy became a leading figure in the Maquis of the Auvergne district, in charge of finance and obtaining arms, and helped to forge the Maquis into a superb fighting force. During her lifetime, Nancy Wake was hailed as a legend. Her autobiography recounts her extraordinary wartime experiences in her own words.